I try not to blog about myself. 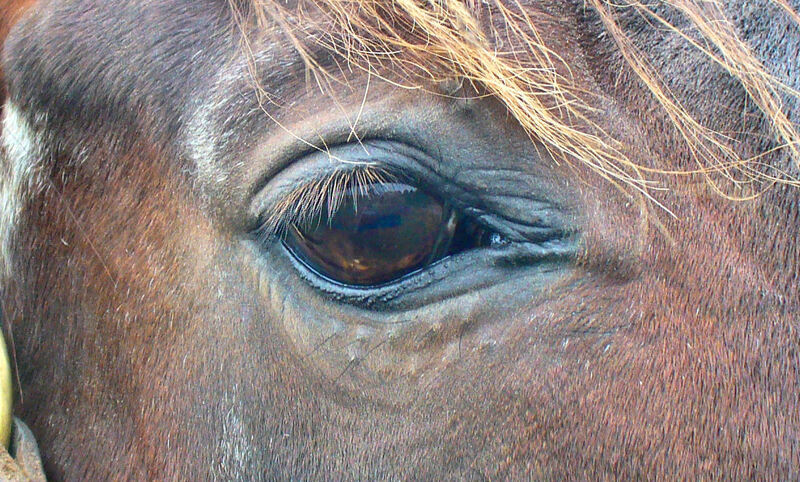 It’s the horses who matter and they are the reason anybody follows this blog. But winter is coming, and Ogygian is 31. He’s happy and comfortable, his appetite is great and he enjoys the things he likes. But since 31 for a Thoroughbred is something like 100 for a human, there are some words I want to say now, while all is well. 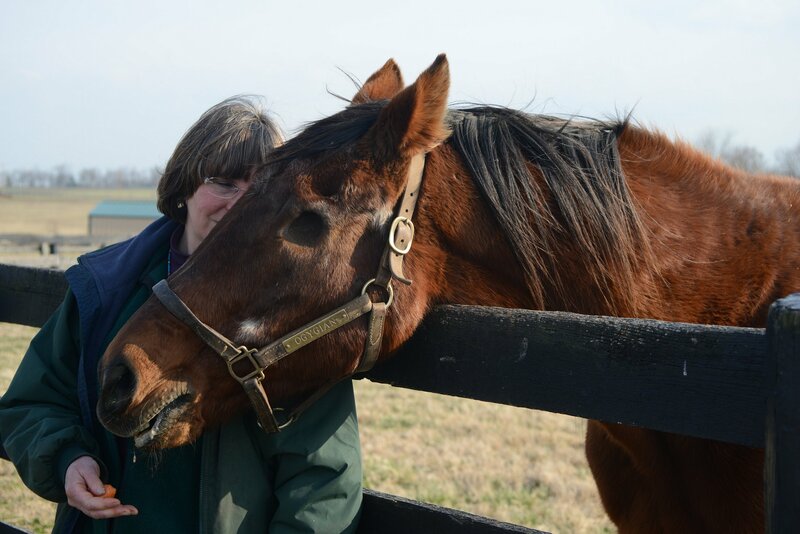 They’ve personal, but I think they also go to the core of what Old Friends is for, and what goes on behind the scenes when a particular volunteer and a particular horse form a bond. Ogygian and I are only one bond among several strong human-and-horse bonds at Old Friends’ Kentucky and New York locations. 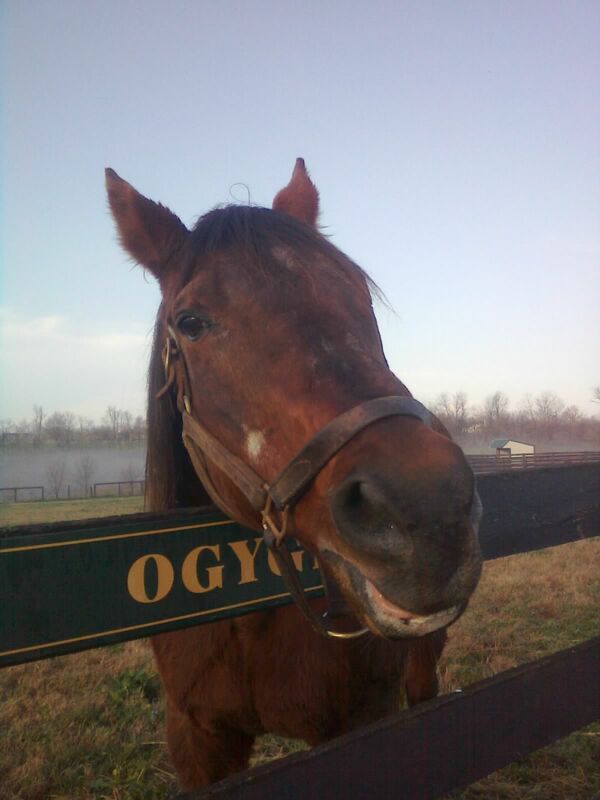 I met Ogygian not long after he arrived in 2005. I’d been a fan of his sire, Damascus, and I’d visited Damascus’ sire, Sword Dancer when he was at stud in Kentucky (though in the ’59 Derby I favored A. P. Slew’s great-grandmother-to-be, Silver Spoon). More recently I’d fallen in love with the exceptional juvenile champion Johannesburg, so I was eager to meet Damascus’ son, Johannesburg’s damsire, Ogygian. He’d been through hard times and was having ups and downs in health and wasn’t yet the strong, muscular, entitled, manipulative, bossy “herd stallion” we’ve known and loved for so long now. But his dignity and presence touched me deeply and I began falling in love. At the end of my first day volunteering in July 2006, I hung out by Ogygian’s paddock just to enjoy the sight of him grazing, but he came over and made it clear he was interested in interaction. We began our friendship that day. It’s been a long, eventful one, and I hope there’s still plenty more to come. I’ve been fortunate to become a regular companion, to groom him, play with him, help take care of him. We have as many routines, games and private references as two people would come to share in nearly a decade. He’s so smart it’s scary. And wise, which is a different thing. I’ve learned a lot from him over the years. He’s good at pushing people’s buttons and I admit he pushes mine. And vice versa. Now, as we approach winter, I admit here (as I don’t admit to him) that though vet checks show he’s healthy, at his age, winter is scary. For me, that is. Ogygian is, as he’s always been, fearless. So, here is what it’s like in the evening when I bring Ogygian the special second dinner Dr. Waldridge and our barn management recommends. Ogygian often meets me at the gate, and as we have long done, we race each other to his feed tub. It’s a trot these days, but Ogygian makes sure he wins. As he eats I feel his body-scoring points through the winter coat he’s growing, hoping for the weight gain that I’m gradually noticing happening. More padding against the cold, please, sir! But the checking dissolves into the enjoyment of a massage, and my enjoyment of the plush fuzziness of the healthy, thick winter coat he’s growing. He enjoys the alfalfa and beet pulp mash I’ve “cooked” him, and we enjoy being together. I lean on him, he leans into me. I scratch his neck, he moves until I’m where he wants me. It’s often the most gorgeous time of sunset. The sky and landscape stretch wide and beautiful from the vantage of Ogygian’s paddock. Sunsets tend to be spectacular there. It may sound like a cliche to say each day is a gift, but I’m always aware how true it is. 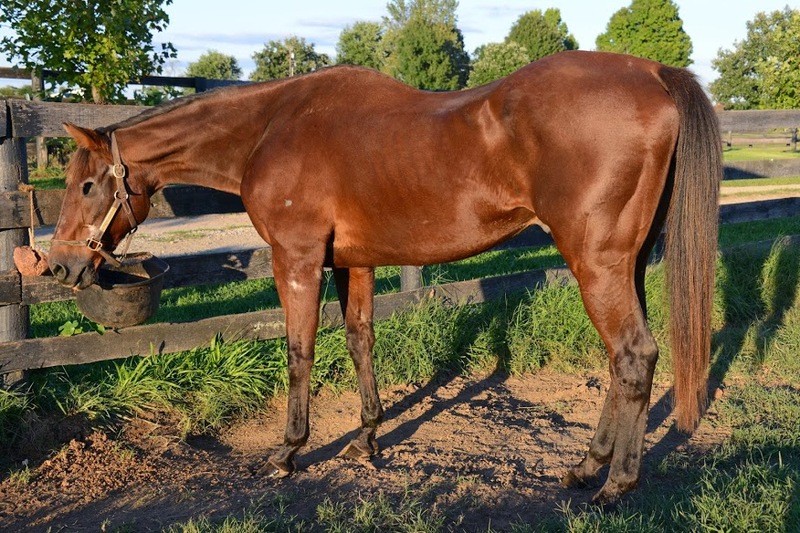 Having Ogygian in my life, and being able to make his life happier, is a bigger gift than I ever imagined all those years I followed favorite race horses at the track and visited favorite stallions at the farms. I can’t afford a graded stakes winner and thought admiring them from a distance was the closest I’d ever get to any horse I’ve followed and admired. Ogygian is one of the great ones. 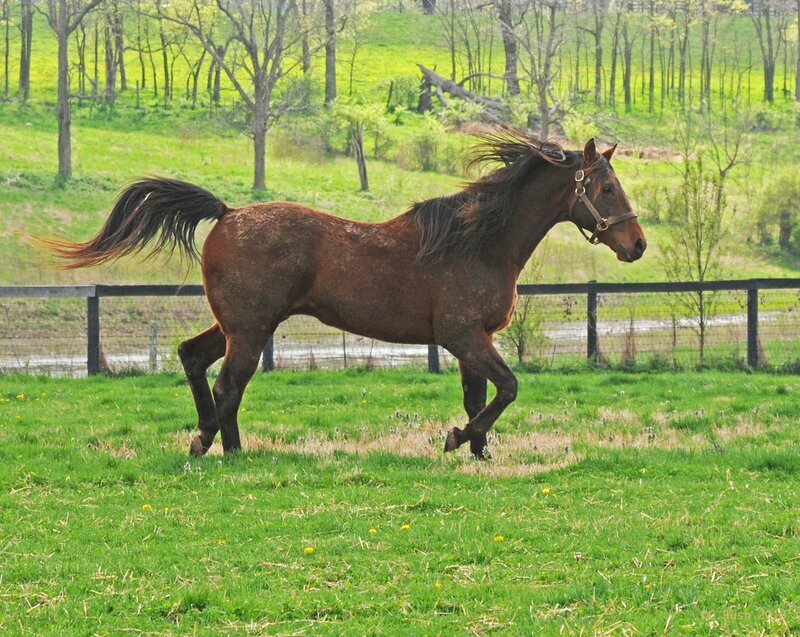 On the track, as a broodmare sire, and just in himself. For me he has become the sum of all that’s magnificent about the Thoroughbred. I tell him so. Often. Ogygian and me. By Laura?